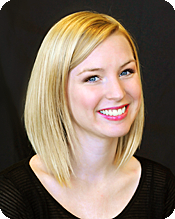 A big welcome to our newest team member Heather Loiacono, Designer! With over 9 years of salon experience, she is an American Board Certified Haircolorist — a prestigious title earned for expert color knowledge and service excellence. Heather has also completed education in extensive color, highlighting, cutting and special occasion styling. She is now accepting appointments. Call us at (484) 872-8457 or submit an online appointment request to schedule.